When you are looking for more control and challenge while fishing, you usually go after a baitcasting reel. Because baitcasting offers you with more strength and control than a spinning reel does. You will want a baitcasting reel to work with as you climb up the ladder of skill. However, baitcasting reels themselves require skill to be managed well. In fact, you have to practice for a while with it to get the best results. If you do not master it well enough, you will never be satisfied by fishing with it. However, it is not just your skills that will help but also the quality of your reel and the materials you use with it. Apparently, the fishing line plays an important role when you are fishing with a baitcaster. Since baitcasting reels are delicate instruments and harder to handle, you have to make sure each component of it is perfect. Now, the type of line you need to use does not just depend on the baitcasting reel itself but also how you fish and what you fish. So, in order to score high in the fishing arena, you must have the best fishing line for baitcaster. How safe do you think you will feel when you wear a bullet proof vest? Apparently, this KastKing SuperPower braided line is made of braided polyethylene fiber which also makes bulletproof vests. So, you can expect similar damage resistance from this line. What will amaze you about this line is its strength, durability and the knots. You will be able to make any kind of knots easily with it. Although some of the strength does decrease with knots, it won’t affect the performance. The line has zero stretch which makes it very sensitive. So, you will be able to feel even the slightest pecks. Furthermore, it has less memory which allows you to cast smooth. You will be able to use longer lines and cast further because the diameter of this line is quite small. It has tests ranging from 10-150 lbs. Furthermore, it is available in a number of colors so you can choose the perfect size and color for the place you are fishing at. Apart from that, what you might face trouble with is the line breaking as a few customers did. Also, you might find the line thicker than you expected it to be. For the price, this line provides you with better quality and performance that you will expect and barely gives you reasons to complain about. Unless it does not fit your requirements. ​​​A very strong and durable line made of abrasion-resistant high-quality material. ​​​Easy to tie a knot in without decreasing strength much. ​​​​​Available in a few different colors. ​​​​​​Zero stretch and low memory. ​​​A few people complained about the line breaking too easily. ​​​​Some found it thicker than expected. If you are looking for a line to go after the big and aggressive fishes, the Big Game monofilament custom spool line can serve you well. Apparently, the line has a good strength rating which is also quite accurate. No one ever had any complaints regarding the strength, control, and confidence this line provides. Furthermore, if it bumps into something sharp or tough underwater, it won’t disappoint you by breaking right there. In fact, it is very shock-absorbent and also abrasion-resistant. As a result, it provides you with the durability you require on those tough and wild fishing sessions. It has a 60 lb test and it works best when used for this range. Making a knot with it for holding the lure is also quite easy. However, although the brand claims that the line has low memory, most customers who had anything bad to point out complained that they have never seen as much memory as this line has. So, this could cause trouble in your casting performance. But, most has a good fishing time anyway. Apart from that, some complained that the line has no stretch as a monofilament line should have and is prone to wind knots and getting tangled up. The positive side of it having no stretch is that it will have better sensitivity. Although this line does have a few cons, for the price and strength, it is something that makes most anglers happy. ​​​Easy to tie knots in. ​​​Features more memory which causes trouble during casting. ​​​​The absence of adequate stretch. If you want to catch fish like a sniper, this is the line that can act as your sniping weapon. In fact, this FluoroKote line has the fluorocarbon which keeps its visibility low in the water. So, the fishes won’t have a clue what awaits them, what’s dragging them and what they need to fight. Furthermore, the line has high strength as well. So, you can target the big fishes without any worries. You do not have to worry about it being damaged much because it is quite abrasion resistant too. The usual obstacles will not be able to take time off its durability. You will be impressed with the casting performance too. The line has low absorption which makes it sink faster. Tying knots in it is also easy but not all kinds of the knot are suitable for it. But, tying a knot won’t reduce the knot strength much. Furthermore, you will be able to feel the fishes biting mildly as this line has good sensibility. Although the line has low memory, some customers expressed that it would be better if the line had even lesser memory. Apart from that, you can cast quite far with it as the line has a small diameter which allows you to use more of it on a spool. ​​​Has very low visibility making it a shock for fishes. ​​​Quite a strong line that allows you to go after the bigger fishes. ​​​Great abrasion resistance which makes it tough against the obstacles. ​​​The line may break for unknown reasons. ​​​​The line may have more memory than anyone wants it to have. Are you fond of experimenting and like to try out different methods of fishing. Then, this Berkley Trilene XL line is a versatile line that you will be able to use in any way you want with baitcasters. Furthermore, it is strong enough to deal with the larger species. You need your line to be strong enough to deal with the uncertainty and this line provides you with the strength you require. Furthermore, obstacles in your way will not stop it either as it has great abrasion resistance. So, it is a really strong and durable line to keep for your baitcaster. You will enjoy casting with it as well. Firstly setting it up with knots is no big deal. Then, you do not worry about the line tangling either. It has low memory to help easy and long distance casts. Furthermore, the casts are quite smooth as well. However, as with monofilament lines, you might not get the sensitivity you require that you usually get from other types of lines. Another trouble with it is quite visible under water and the color, according to a few customers, comes off when the line touches the water. Apart from all that, this line is a strong, affordable and functional line to take with you for different types of fishing with a baitcaster. ​​​​Versatile so it is capable of taking on various methods of being used. ​​​​Features a good amount of strength. ​​​​​Good casting performance with long-distance and smooth casts. ​​​​The stretch might not make it sensitive enough. ​​​​​The dye comes off when it touches the water. Want to trap your target like a spider web traps its preys? Then, this SPIDERWIRE line is for you. In fact, it is quite invisible underwater, so the fishes will not have a clue what hit them. Furthermore, it has a low diameter which lets you use longer lengths of it and also keep its visibility low. However, you will be able to see it clearly over water. What will amaze is probably its strength. This line has a high strength which is mostly due to its strong braided and high-quality build. Apparently, it has an ultra smooth 8 carrier braid made from a combination of nylons, fluoropolymers, and High Molecular Weight PE fibers. As a result, its durability and strength to fight are not matters that should concern you. It has an innovative cold fusion process and casting with it is fun too. You will like how smoothly and nicely it hits the water when you cast it. Furthermore, it is quiet too. All the more reason that the fishes will be clueless. However, there are a few problems you might face too. Some complained that the line broke way too easily. There are complaints about it being too visible as well but from a very few. Although managing the line is quite easy and the line itself is durable, it will stain easily in dirty water. It is not the best line out there for some of its cons but it is still worth a try for the feeling it provides due to its unique build. 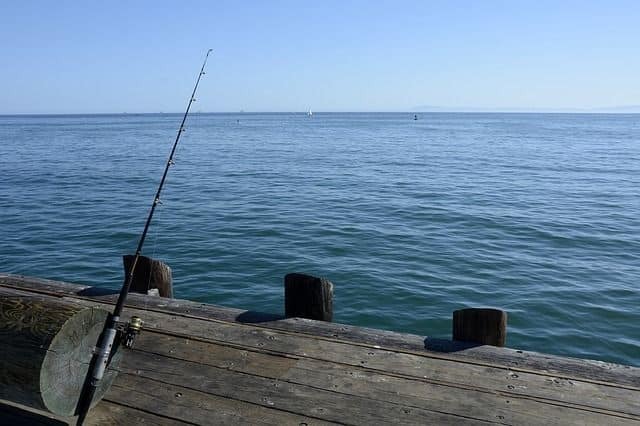 ​​​​​Invisible underwater to the fishes but visible above water for the angler. ​​​​​Very strong dues to its strong braided build of high-quality materials. ​​​​​Might seem visible if the braided parts come off. ​​​​​​Some customer found it too sticky to cast easily with. Small is not necessarily weak and this line proves it. Are you on the lookout for a line that has a small diameter but high strength? Then, this is the line you need. You can load longer lengths of it and cast far while not sacrificing any amount of strength. The secret behind its strength is the braided line with eight fibers in the making. Apart from that, this line has high abrasion resistance which makes it durable for long-term use. So, you not only get stronger, long casts but also durability from the same line. While casting with it is quite easy you might face a few problems. Firstly, bird nests and wind knots might occur after you cast for a while. Secondly, a few customers complained that the line broke way too easily. Other than this, the brand claims that the line has TGP technology that improves the color retaining capability of the line. This is a good news but a customer complained that the color faded after a few casts. Therefore, as long as the line does what the brand tells it does and you get the right product, it is a great line. But, if it somehow does not, you can tell it’s bad luck on your side and inconsistency on the company’s one. ​​​​​​Small diameter lets you wind more of it on the spool. ​​​​​​​Some of the customers complained that the line broke too fast. ​​​​​​​Wind knots and bird nests tend to occur. If you are looking for a fluorocarbon line that does great in freshwater, then this might just be it. Apparently, it gives you the right balance between solid and soft. It is quite solid when it comes to providing you with the strength you require. Then again, it is very sensitive to the light touches of the fishes too. You will get just what you expect from total fluorocarbon lines with this line. It has extremely low visibility underwater and there is not a single complaint about its low visibility. Apparently, it is for a 200-yard spool and weighs 0.12 pounds. You will enjoy casting with it as it is easy to cast with and hits the water very smoothly. Furthermore, you know how fluorocarbon lines are sensitive to UV rays and other chemicals. But, this line prevents damage from these factors. However, a few customers still complained that it loses its durability too fast. Apart from that, it performs best as a leader rather than the main line. Finally, it is super affordable! ​​​​​​​An actual fluorocarbon line with minimum visibility. ​​​​​​​The right balance between solid and soft. ​​​​​​​​Casting with it is easy. ​​​​​​​​Resistant to factors that usually damage fluorocarbons. ​​​​​​​Susceptible to bird nests and knots. When you are fishing you do not want to alert the fishes by making noise that they are under attack. For this purpose, you need a line that casts really quietly and this is the line that does this job extremely quietly. The fishes won’t even hear the water splashing because this line is smooth as silk and won’t make such a ruckus. Apart from that, you might think that the line must not be very strong if it is that quiet. But, you are wrong. It has a very high capability and strength and it casts like a bullet. Moreover, you can select from a number of sizes and capacities so you will find the perfect one for your baitcaster. The line is very abrasion resistant as well. So, you do not have to worry about its durability much. However, you might have to worry about wrong handling breaking it too easily because a few customers complained about it breaking. Another popular complaint is that the line seems to fray too easily. Although the line usually does not form wind knots or bird nests, a few customers complained that it does. Apart from the cons, the line performs really great for the cheap price it is available at. ​​​​​​​A number of sizes and capacities to choose from. ​​​​​​​​Easy to cast and good casting performance. ​​​​​​​​​Wind knots and bird nests form easily too. In case you are a beginner and you want a super cheap line then you can try your luck with this KastKing Masters monofilament line. Apparently, you don't expect a line to be functional at the price this line comes at. However, it is much better than even some expensive lines. In fact, it provides you just the right combination of strength and durability. You cannot expect the strength of a braided line from a monofilament line but this line provides you with the best of the strengths monofilaments are capable of providing. Furthermore, it is very resistant to abrasion which makes it durable. You can also cast smoothly and far as this line has a thinner diameter so you can use longer lengths of it. It also has less memory so the number of trouble with wind knots will be low. However, any line of a good length is susceptible to form knots and therefore, you cannot trust the low memory alone. The line has a bit too much stretch which causes trouble in case of sensibility. However, that is something all monofilaments do. In conclusion, this cheap line is great for beginner adventures as it provides a good enough assurance of good performance while not being the best. ​​​​​​​​The right combination of strength and durability. ​​​​​​​​​​Wind knots and bird nests can form. ​​​​​​​​​​Knots might break the line too easily. ​​​​​​​​​​Not of the best quality. This is another cheap monofilament line that will help your beginner adventures. Apparently, this is also a line that has great strength and also durability. It will provide you with the strength you need to fight the smaller and medium-sized fishes. Moreover, it is quite easy to handle and will provide you with a good control over the casts. Furthermore, it has a low memory which helps to reduce the number of wind knots and bird nests. The line will not break easily when serving you and that is an assurance. Forming knots in it is also very easy as it is with any other monofilament. The line, however, will decay over time due to exposure to the sun and other inevitable conditions. But, while it services you, it will barely cause any trouble. It’s green color works really well in certain fishing areas where this color decreases visibility. ​​​​​​​​​​Provides ample control to the anglers. ​​​​​​​​​​Low visibility in certain types of water. ​​​​​​​​​​Decays over time due to exposure. ​​​​​​​​​​Might form wind knots and bird nests. ​Determining where you will fish is not important only when you are buying a baitcasting line but in any other fishing situation. You do not even travel to a place without knowing about its weather and taking the right line of clothes, do you? When it is about fishing, you have to even more careful about this. So, are you going to be fishing in clear water or sea water or ice water or whatever other kinds of water there is? You have to determine the exact one and find a line that is best for that kind of water. After determining the place, you have to know what you are dealing with. In fact, keep your enemies close remember? You have to know them first to determine what you need to capture them. When it comes to fishing, it is mostly the habits, size, and weight of the fish that is important for you to note down. Because the line must have features to help you deal with that particular species. Monofilament: This is something like the beginner’s haven. Monofilament lines are really easy to deal with because you cast using your thumb and monofilament makes it easy. Furthermore, you will rarely face any backlashes when working with it. It does tend to form knots but you can easily get rid of these knots as this material has high stretch-ability. The problem, however, is that it is not very resistant to abrasion. So, you will need a more durable line for dealing with rougher conditions. Braided: While monofilament offers so much stretch that the sensitivity of the line gets reduced, braided lines offer no stretch and provides you with a very sensitive line. Furthermore, it is resistant to abrasion and a very strong line. The only drawback is exposure to UV damages it and also it is very visible in the water. Fishes will be able to see it easily. Fluorocarbon: If you want your line to be invisible under water then a fluorocarbon line is what you need. It is quite strong and durable. However, it is not the best line for baitcasting as it is more susceptible to backlashes when used with a baitcaster. Fusion: If you have ever tracked the best solution to any problem, you may have noticed that it is generally a combination of all the good features. So, in this case, a fusion line combines all the good features of the above-mentioned types of line. It is strong, durable, sensitive and also very easy to handle. However, you cannot just one kind of feature to perform the best. This is basically great for big game fishing. ​You do not want to be pulling in a huge shark with a thin like the hairline. The line will probably just break when it touches the water let alone the shark. So, considering the species you are after, you have to choose how much pressure should the line be able to take? Because if you are after a 10-pound fish which fights with an aggressiveness of a 12-pound fish, you need a line that can withstand 12 pounds or more. So, determine what you need the line test/ breaking load to be. ​You have the perfect test and all but you cannot even cast to where the species you are after are swimming. Therefore, the line’s length matters as well. Apart from considering how far you want to cast, you have to consider how much length your reel can take too. Usually, there is a relationship between the line weight and length capacity written on the reel itself. Therefore, consider the length you want to cast at and the reel’s capacity. ​Yes, you guessed it right; the next on this list is the diameter. We cannot leave the diameter out now, can we? So, the diameter is also crucial for casting performance. The more the diameter the greater the friction will be. As a result, the distance covered will also be less. And, lesser the diameter the distance covered will be greater. Apart from that, the reel can hold longer lines if the line's diameter is less. Because it will able to accommodate more of the thinner lines. ​When you are casting with a baitcaster, you need the extra strength. In fact, your line has to be strong enough to not just deal with the fishes but also the strict boss- the baitcasting reel. Therefore, it has to be very strong and durable. Furthermore, you do not want your line to break all of a sudden either. This is not just the result of the too strong fishes being aggressive but also the line quality. Therefore, to get the maximum out of what you pay for, be sure that you are buying a good quality reel with maximum durability. ​You will find different kinds of lines at the same price and the same quality lines at different prices. It is best to keep a moderate budget because when it comes to lines, not all expensive ones are great and not all cheap ones are bad. All you have to is neither be too frugal nor be too extravagant and just have a good judging eye. ​As you already know that baitcasters are stronger than spinning reels. Therefore, the line it uses should also be able to handle the enhanced power and strength requirements. A baitcaster with a weak line will just be useless. Therefore, lines that are great for baitcaster are naturally very strong. ​Baitcaster come handy in rough water conditions while fighting tougher fishes. In fact, it is not just the fishes that the baitcaster has to fight but it has to fight with the other environmental conditions as well. Therefore, lines suitable for baitcasters have more abrasion-resistant properties than other lines. So, the best fishing line for baitcasters will delight you with its abrasion resistance. Q. How Long Can One Line Be Used For? Answer: The problem with lines is that no matter how good it is, it will decay or degrade over time. In fact, the line will not be as great and durable as it was last season in the new season. Although braided lines nowadays last longer than other lines, there are still a number of inevitable factors that influence the line’s durability. Therefore, for the best performance, it is best to change the lines periodically. When you are at war, you have to make sure each of the weapons you use is as best as it can be. So, when you are fishing with a baitcasting reel, the reel will not perform its best if you pair it up with a line that is not perfect for it. The line should not just be the right fit but should be of high quality and efficiency as well. It is only knowledge and experience that can help you find the best fishing line for baitcaster. You now have the knowledge to go out there and gather the experience you need by experimenting.